Cover Launch: Mystery Cover Revealed! Hey remember this picture? Way back in August I was working on a photo shoot with photographer Laura Hanifin for a cover, and I had to share a picture of one of the crazy props we were using that day. 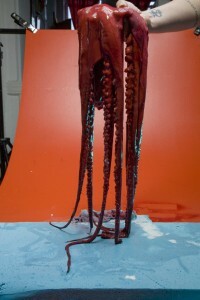 Yes, it was a real live—well, actually, dead—octopus, which Laura had dyed with food coloring in a ziplock bag in her fridge. Yes, I am the one holding it, and yes, it was really really slimy. A few people DID guess that the octopus was standing in for some kind of intergalactic space creature, and I can finally say that you are correct…and the mind that thought up that creature is none other than Philip Palmer, author of Debatable Space, Red Claw, Version 43, and now…Hell Ship! A starship travels through space carrying thousands of slaves. Each slave saw their homes, their families, and their entire world crushed by the awesome power of their new masters. And each and every one of them hungers for revenge. Now, another planet burns and their greatest hero is defeated, captured, and enslaved. Sharrok swears he will have his vengeance. No matter the cost to himself. 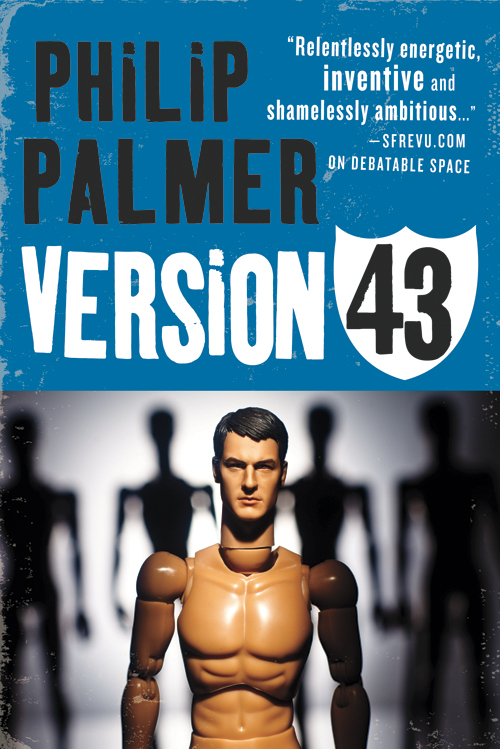 No matter he threatens the fragile peace between the war-like slaves. No matter that his captors are possessed of technological powers so advanced, they seem like magic. There is another hope. One man, once a peaceful Trader, pursues the ship for its crimes. Battle after battle has left Jak scarred and broken and bit by bit he has surrendered his humanity to his pursuit. Now, Jack is no more than a mind in the body of a starship. Together, one working from within, the other from without, there is, just possibly, a way to end this long, interstellar nightmare. As you may know if you’ve following Orbit cover posts for a while, I’ve been really enjoying creating a new author look for Philip Palmer. 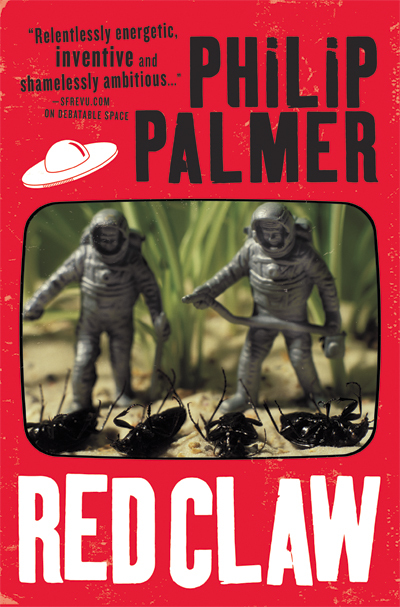 The energy in his books reminds me of the best old science fiction pulp stories and that’s married to a modern attitude and irreverence. 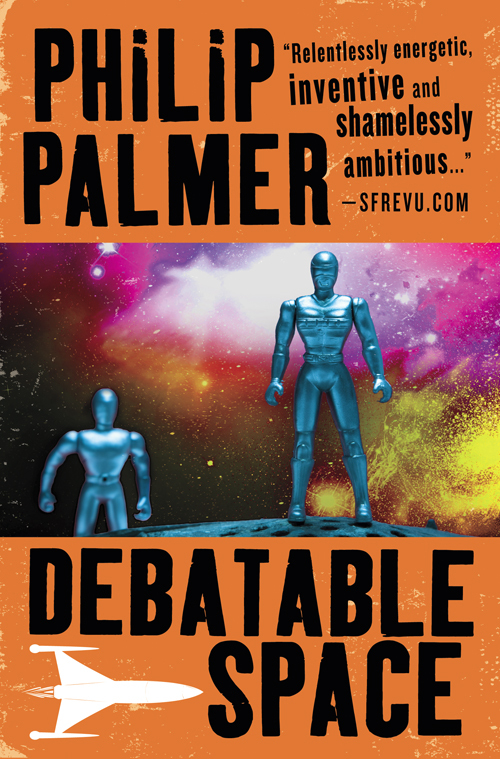 I think the retro-feeling cover style speaks to that sensibility, and we wanted to go back and repackage his first Orbit book, Debatable Space, to match this look. Luckily we had so many fabulous images from the Hell Ship shoot that we were able to use one that worked better for Debatable Space. Now it is debuting as the newest ebook in our Orbital Drop promotion. Make sure you sign up to get a new Orbit ebook deal sent to your inbox every month. Flanagan (who is, for want of a better word, a pirate) has a plan. It seems relatively simple: kidnap Lena, the Cheo’s daughter, demand a vast ransom for her safe return, sit back and wait. Only the Cheo, despotic ruler of the known universe, isn’t playing ball. Flanagan and his crew have seen this before, of course, but since they’ve learned a few tricks from the bad old days and since they know something about Lena that should make the plan foolproof, the Cheo’s defiance is a major setback. It is a situation that calls for extreme measures. Luckily, Flanagan has considerable experience in this area . 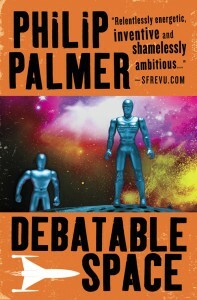 . .
Debatable Space, Red Claw, and Version 43 are available now in Trade Paperback and ebook. 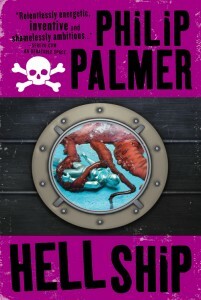 Hell Ship is out in July 2011.